Review posted December 3, 2017. Capstone Young Readers, 2017. 32 pages. 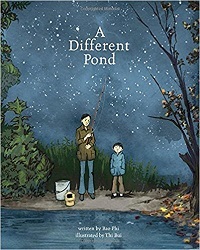 This picture book tells the story of a small boy and his father going fishing early in the morning on a Saturday. It's lovely father-son time and focuses on how the boy feels grown up because he's helping his father. Along the way, we learn that the father used to fish with his brother at a pond in Vietnam. They both fought in the war, but one day his brother didn't come home. We also learn that the father has a second job and the mother works, but they still need to fish to be sure of having food for dinner. Because everything is expensive in America. I like the way the book focuses on warmth and love and this shared activity instead of the hardships in the background. It reveals those hardships in a gentle way. And the paintings are wonderful. On many spreads, there's a creative use of inset panels. The story happens almost entirely before the sun comes up, but the artist gives texture to the night sky and the darkness. A story about fishing with a father that has much more behind it, and is presented in a beautiful format.